‘Les Fleurs Du Mal’ is the title from a collection of works by no-one else but Monsieur Charles Baudelaire, and now it is the title for a new album by Ukrainian project While They Sleep as well. This outfit of Kvolkaldur (he acted under the monikers Ildverden and Prosopagnosia too in the (recent) past) did release a first album in Spring 2016, but due to circumstances I had not the ability to write anything down about that material (yet I did listen to it several times, and I liked it). Anyway, Kvolkaldur wrote and recorded a second album, named after that Baudelaire-stuff, which goes totally further where the former album, La Nausée (also entitled in French!) ended. The lyrics are taken from Baudelaire’s original poems, translated in English. Personally, I appreciate this kind of tribute – I am, for example, quite keen with poems like The Vampire – so that kind of poetical satisfaction gets fulfilled. But that does not say anything at all about the sonic side of While They Sleep. Yet in comparison to the former album, which I did (and still do) like quite intensively, not that much did change. 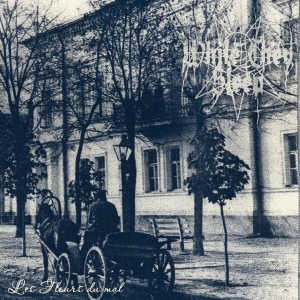 While They Sleep still brings quite oppressive, obscure, mesmerizing, eerie, ominous and asphyxiating Doom-laden Black Metal with a funereal, even DSBM-alike atmosphere. The whole sounds quite rhythmic – especially the drum salvos cause that feeling – with a focus on quite elegant and majestic guitar leads and post-blackened vocals. That ‘post’ attitude surely reappears throughout the whole of the album, being able to balance in between the glory of the (Nordic-style) Old School trend at the one hand, and the modernistic technical elegance of the current scene at the other. It’s like the feeling I got when experiencing the debut of mighty Belgian act Panchrysia, you know, with that comparable equilibrium in between blasting eruptions and down-tempo parts, and that grandiose rough-edged production on top of it. I had the intention to keep this review short and right-to-the-point. So I come up with my conclusion. Les Fleurs Du Mal is, just like its predecessor, a fabulous recording that will please all those who do appreciate somewhat Post-oriented Black Metal with a merely mid-tempo oriented performance attitude. The sound quality involved is just top-notch, at least for this specific sub-genre (once again: mind the reference to Panchrysia’s earliest efforts! ), and the artwork brings that undeniable atmosphere of autumnal depression and winter-blues. A short review, I admit (for my concern), but quite focused: top-material, once again, and highly recommended if you like a somewhat depressed, unhappy form of anti-speed-up Black Metal!